A pint of beer and shamrock design make this 4-coaster set perfect for the Irish Pub style basement or outdoor bar. Use these coasters with their cork backing and mahogany caddy to protect your furniture before, during and after the Irish ale runs out. 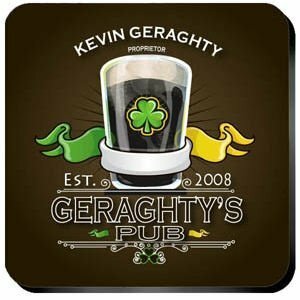 The clever, full-color design is customized with a first name, last name and year that this Irish Pub was established. Makes a great gift!